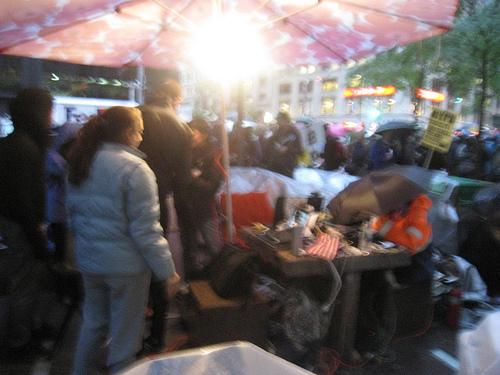 Continuing down Broadway, the rain picked up from a drizzle to a steady flow and when I came upon Zuccotti Park, the first thought that hit me was that there were more people than last week. The second thought was, these are determined people, as the rain got heavier. I arrived around 5:30 and was to meet Dan Patterson (you should read his coverage –he’s using social media in brilliant ways to report on Occupy Wall Street) at the orange/red sculpture on the south-west side of the park at around 6. So for the next half hour I wandered the park, spoke to a few people and took down notes. Here’s what I observed. Yesterday’s crowd was much younger – more late teens to late twenties – and more festive than last week. This may have to do with the rain, but with the Occupy Wall Street movement spreading to other cities, the disaffected youth are getting involved. Chants of “All day, all week, Occupy Wall Street” from 11 people who looked to be in their twenties were synchronized with the beats emanating from the growing drum circle – again, mainly a younger audience. But don’t mistake the festival atmosphere in Zuccotti Park for lack of organization. In the seven days since my previous visit, the infrastructure that I reported as lacking has gotten significantly more cohesive. Their media center is impressive, with many computers up and running (one of them had a map of the weather system, showing rain for about an hour before it would stop). Food that was donated is set up buffet-style for those hungry. All organization is done by anyone who wants to help. People with buckets roam the park asking for donations for various items – the ones I saw were for tarps and gluten-free foods. And, just as last week, there are signs at the entrances of the parks showing the daily schedule – breakfast at 7:30 am all the way up to the final General Assembly of the day at 7pm. This is not a well-oiled machine, yet, but it appears to be moving in that direction. Externally, organization still has a ways to go – especially as cities across the nation co-opt their own versions of Occupy Wall Street. Protests have popped up in several places, including Los Angeles, Albuquerque, Boston and Chicago. Their online presence has gotten stronger, too. Their website, OccupyWallSt.org posts important information – where to donate, where to protest, where to mail stuff, minutes from meetings and the daily schedule – and the media blackout no longer exists. Last week, there were a lot of print reporters/bloggers, seeking out interviews. Yesterday, local NBC, CBS and CNN affiliates were broadcasting from the park. They also created a popular Tumblr blog, WeAreThe99PerCent, showcasing people’s stories of struggle. It’s a passionate, real-world play focusing on the hard times that many of us have fallen onto. Messaging still has a ways to go, as I spoke to two men who appeared to be in their thirties (again, anonymously – small sample, I know, but it seems like the older, job-holding protesters are still only in half way, with one foot in the protest and the other in the corporate world; this will be something to follow) who had different ideas of where Occupy Wall Street should go. So I asked these two men – I’ll call them Robert and John – if they thought this confluence of issues diminishes the overall objective of ending corporate and political malfeasance. At this point, someone came by to listen to our conversation and started filming, which, naturally, ended the discussion since John and Robert wanted to remain anonymous. But these kinds of talks are occurring all day throughout the movement. I spoke with Alex, age 40, who was sharply dressed, as he walked through the outskirts of the park. Alex is a hedgefund manager, who requested to not use his last name, and talked to me about the symbolism of the area. Alex believes this movement will only get bigger as it morphs into what he thinks will be the progressive response to the Tea Party movement. Finally, the last two developments since last week were the Brooklyn Bridge protests and the support of the Transit Workers Union. If you aren’t aware of what happened at the Bridge, you can read about it here, here, and here. The TWU Local 100 has 38,000 members in NYC and 200,000 members in 22 states. Should this movement progress and other unions who represent people in all walks of life get involved it will create a political football. How can a member of Congress or even a presidential candidate ignore those unions who put their collective weight behind them? This is a different story than what happened in Wisconsin, as TWU is not a union for government workers, but for the private sector. Now imagine unions across the nation who work for major industries decide to join the cause. We’re in week three of the Occupy Wall Street protests, but it’s only begun.